STYLE: SUKI. FLUID DENIM. 100% AUTHENTIC. STYLING AS SHOWN. GREAT PRE-OWNED CONDITION. Size: 34 / 17. Inseam: 30". Condition: no holes or stains. Bottom hems show minor fraying. ~SILVER JEANS~. 10.5" leg opening flat. machine wash. Fit and Sizing. 33" inseam. SUKI MID FLARE. SILVER JEANS. Zipper Fly w/ Button Closure. Total Length ~ 44 1/2". 5 Pocket Style. Bottom Leg Width ~ 12". 100% AUTHENTIC. STYLING AS SHOWN. Leg Opening: 10. --------Rise: 8.5. Tag Size: 24/33 Waist: 43" Rise: 9.5" Hips: 46" Inseam: 31.5" Leg Opening: 18" Material: 99% Cotton 1% Spandex. Distressed these are worn & abraded at hem and pocket edges. Silver Jeans. Plus Size 22/33. 27x32. In great condition. See pictures. Tag Size 26/33 Waist: 50" Rise: 11" Hips: 55" Inseam: 33.5" Leg Opening: 20" Material Content: 99% Cotton 1% Elastane. 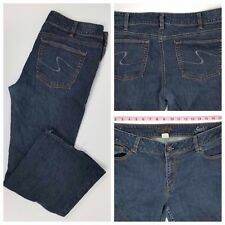 Silver Jeans AIKO low straight plus SZ 16. 36x34 Condition is Pre-owned in good condition bottoms are pretty clean button and zipper good little to zero wear on thighs. Model: Sam. • Front Rise: 11". • Leg Opening: 15". All photos are of the actual item you will receive. Good used condition! • 1% Lycra. • 6% Polyester. • 93% Cotton. 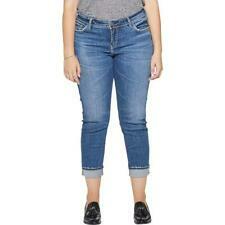 Buckle BKE Women’s Payton Curvy Skinny Mid-Rise Jeans Plus Size 33R. Condition is New with tags. Shipped with USPS Priority Mail. Style: Aiko Mid Slim Boot. Material: 78% Cotton, 21% Polyester, 1% Elastane. Front Rise: 11". I will then send you a revised invoice. Leg Opening: 17". Size: 20 Length 35. Great pre-owned condition with no stains or flaws noted. Hip: 27.5". Waist: 23". I'm here to help! VERY NICE - no significant flaws. Very light wear. SIZE : 34 x 31. These are nice jeans with a broken-in condition. They can be worn as is or would make great capri’s with a nice crop and roll! The inner thighs are worn thin! In the item specifics I list size 6 as size 6, but I list size 28 as size 28 in. Silver Jeans Co. 'Elyse' Capri. With a comfortable mid rise, relaxed hip and thigh and eased curvy fit, the Elyse is made to eliminate muffin top. It's crafted with super-stretch denim that's lightweight and incredibly comfortable. 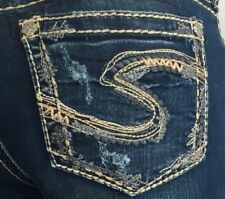 H265 Silver Jeans FRANCES 18" Low Rise Bootcut Stretch sz 24 x 33 Minor Repair! 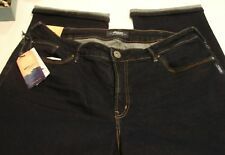 Curvy fit skinny jeans with a dark indigo wash. Power stretch denim with highest stretch and recovery. 5-pocket styling with a zip fly. 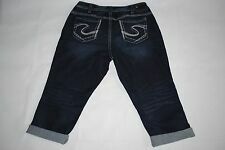 Good Solid Pair of Silver Suki Boot Cut Jeans Size 29. inseam from crotch 30". • Aiko Kick Flare. Condition can be subjective and get overlooked. Color may vary slightly due to lighting conditions. • Silver Jeans. 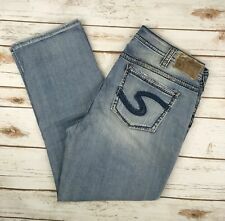 Silver Suki straight leg jeans in a size 18. 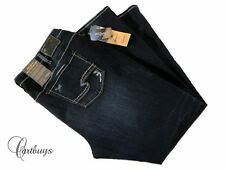 These jeans are very distressed with several holes, in excellent used condition. 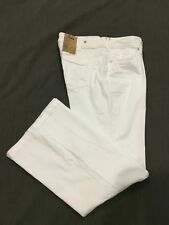 Silver Brand Suki Jegging Size Women’s 14. Condition is Pre-owned. Shipped with USPS Priority Mail. Silver Jeans Suki Mid Boot Cut Jeans. Dark Wash With Factory Imposed Fade. Rise: 11.5". 73% Cotton 13% Viscose 13% Polyester 1% Elastane. Machine Washable. Waist: 19" Unstretched Across. Condition can be subjective and get overlooked. Color may vary slightly due to lighting conditions. • SILVER JEAN. 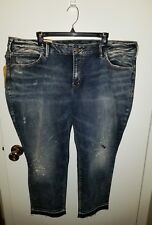 NWT $99 SILVER Elyse Curvy Straight Mid Rise Jeans Sz 24(46) X 32. Condition is New with tags. Shipped with USPS Priority Mail. Size Marked: 22 L24. Smoke Free! We are a non-smoking household. Rise - 10.5. Silver Jeans. Super skinny leg. Crisp white. Color: White. A high-rise waist and a well-defined curve from the waist to the hip with a relaxed hip and thigh.Signature stitched back pockets. Machine wash. I will not mark as a gift or as a lesser value. Designer: Silver Jeans. 22" across waistband, 11" rise, and 27.5" inseam. Curvy fit, Suki jeans are consciously designed to play up your all your best assets with unique shape-enhancing details for the perfect hourglass silhouette. It features a classic everyday igh rise with the perfect front-to-back proportion and an extreme contoured waistband that hits right where you're curviest to prevent gapping. Finished with a dark indigo wash and thick stitching. Low Rise, Flare, Stretch. Rise - 10.5". Double the number. 141618202224 in.27 in.28 in.29 in.32 in. 5XL3X14W16W18W20W22W24W26W28W30W32W34W36W38W31 in.32 in.33 in.34 in.36 in.38 in.39 in.40 in.42 in.